It is possible to make online reservations for the part in green. For other lessons, please ask at the Ski school reception on the day. Rental fee is not included in lesson fee. Ｗｅ advice you to book your lesson thought our web site by 17:00, two days in advance to the date of your desire. Depending on availability, it may also be possible to book on the day. Please stop by the reception and make an inquiry. Please send us your questions through our English Lesson Inquiry Form. On the day of your lesson, please sign in at the reception 15 minutes in advance to start time. Please finish paying for your lesson at the reception before your lesson starts. Ski school reception is located next to the Ropeway station on the top. Weekend can be very congested. Please allow or sufficient time. If we do not hear from you, 15 minutes after your start time, we will deem that your lessons is cancelled. Please make sure to contact us to cancel your lessons. No show cancellations and frequent cancellations may prompt us to decline our service to you. Skiing will get impacted by weather. You may not enjoy skiing in inclement weather. We may refrain from providing ske lessons if conditsion s are not safe(good). 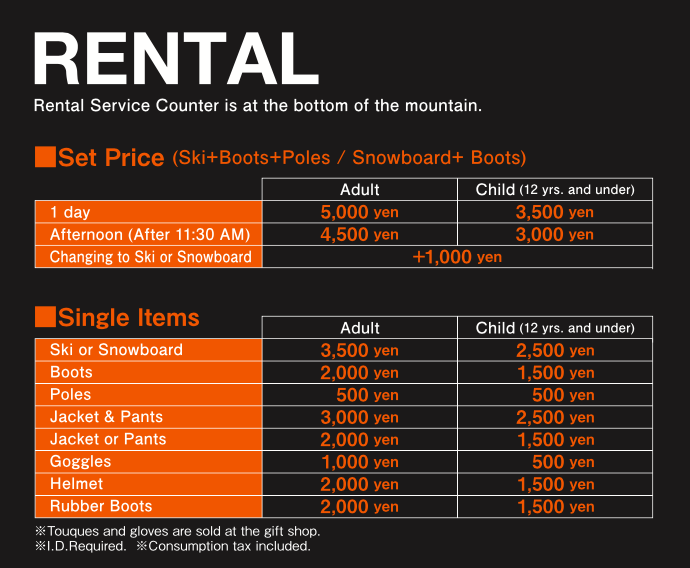 ★Skis, boots, snow sports wear (top and bottom) are available to rent at the Rental Shop. Please pick ski poles up at the Ropeway Station on the top of the mountain. ★For safety, we recommend wearing helmets, especially for children. Helmets and goggles are available to rent. ★Gloves are not available to rent. Please bring your own. ★Lift Ticket: The Lift Ticket is not included in the lesson fee. Please ask your coach which kind of ticket is good for you.